FAQs about Japanese used cars sale, shipment and payment to Car Junction. 1. Take a look at our online stock catalogue. 2. Select a vehicle of your choice. 3. Click Get Invoice button & submit the form with all relevant information. 4. The affiliated Pro forma invoice will be sent to you through email or fax, so do check your emails. 5. CIF Prices, all bank details and the mode of payment will be mentioned in the Pro forma invoice. 6. Arrange Payment. Please note that your selected vehicle will only be reserved on the full receipt of payment. 7. 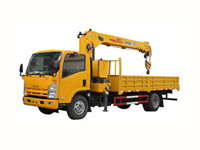 The vehicle will be safely shipped to you when the above steps are completed. 8. The vehicle will finally reach the port of discharge and you can receive it. 9. Enjoy driving your Car. Keeping lower margins as compared to other competitors. Focusing on cost along with high product quality. Quality means high product value at low cost for us. Car Junction is a prized member of all reputed automobile auctions in Japan such as USS , JU, BCN, etc. We keep an eye out for economical and excellent quality vehicles on the Japanese market. We buy such vehicles and forward them to our respected customers at affordable prices. All vehicles available at Car Junction are bought from popular auto auctions, franchise dealers and wholesalers belonging to the central regions of Japan and its whereabouts. All vehicles are properly checked by our team of professional technical staff before we stock them. The vehicles present in our online stock list are property of CarJunction.com. We are neither third-party agents nor brokers. You need to click here to create a new account and start shopping from us. You can print the Pro forma invoice by clicking on “Get Invoice” button after you select a vehicle from our stock. We recommend you go through the available list of questions mentioned at the top of this page to save time. In case of any other questions, you can write to us at [email protected]. Primarily, it is our priority to purchase vehicles of good quality, affordable price and low mileage. We sell these cars on ‘as it is’ basis. Secondly, Japan is known for its high usage of rail transport as far as travelling is concerned because it saves their time and is cheaper as well; this why cars have lower mileage. We can export to any country where there is a legal law to import used vehicles from Japan. Yes! We do have an efficient technical department that is responsible for inspection and checking of all cars before shipment. 1. Take a look at our online Japanese used cars stock catalogue. Your pro forma Invoice is ready to print! If the vehicle you desire is already sold to another customer then there is no reason to worry. We have the ability to provide vehicles on demand for our customers because of the great number of auctions we deal with. However, it must be noted that a deposit in advance will be required for availing this type purchase. Do email us, so that we can provide you with a special request order form. If you want to purchase a Japanese used vehicle which is not listed in our available stock then you can email us at: [email protected]. We can arrange it especially on the request of our valuable customers. We recommend our customers to make the following adjustments to their vehicles after it is delivered. • Change oil and oil filter. • Check tyres, change according to meet local standards and requirements. • An interior and exterior service. If there are any minor or major problems in our vehicles we declare it on our website, because we work on the philosophy of keeping things transparent with our customers. Once we have received your full payment, arrangements will be made for the shipping of your Japanese vehicle immediately on the next available vessel. All documentation in regards to shipment will be sent to you by courier service after the ship has left its starting destination. This is done so that it can be ensured that the documents reach you conveniently before the ship arrives at your selected port. You just need to inform us about the country you are willing to register your car in. Our sales staff will inform you about the most appropriate port of discharge by email. When You receive your shipping documents contact local shipping agents who will guide you on the later procedures. You can also Email Us and we can provide you the contact details of clearing agent according to your country. d. Full contact information such as Contact No., Fax No., etc. e. If the consignee and the purchaser are different than please let us know. Please provide us with the above information in order to make sure that all the shipping documentation is correctly prepared before the shipment. Yes! CIF (Cost of Insurance and Freight) already includes insurance from one port to another port. Arrangement of shipment can be started from the next day after the receipt of your payment. Almost all of our used cars in stock have ready ‘Export Certificates’, so in normal circumstances we are never late. However, ocean shipment depends on the shipment destination of your Japanese car and may vary if it faces any unforeseen situation. Once the vessel carrying your vehicle is departs from our port we will receive the shipping documents from the shipping company. Then, all necessary documents will be sent to the address mentioned in your order form or address you requested for. Please be sure to inform us with the postal address and contact numbers prior to the shipment. When the booking for shipment is finalized for your vehicle, the shipping department will send you an email or fax notification which will contain information of the estimated time of departure (ETD) and estimated time of arrival (ETA). Telegraphic Transfer and PayPal are two modes of payment which could be opted for transaction. Usually telegraphic transfer is the swiftest, simplest and most secure method of payment. Processing time of payment is dependent on the mode you select. In case of PayPal certain terms and conditions apply. We work on the policy of first come first serve, so make your payment as soon as possible to reserve your dream vehicle. You can see our bank details on our website as well. CIF stands for (Cost+Insurance+Freight) it covers freight, port to port insurance and other costs of freight. Where as FOB price stands for (Free on board price); it means that price does not include insurance, Freight and Inspection charges. It varies from country to country; some of them have legal inspection requirements while others do not have inspection charges. We will quote inspection charges separately if your country has inspection requirements. Our Japanese used cars are shipped without inspection and inspections are only arranged on the request of our customers. Our insurance is what the shipping company provides i.e. port to port only. We do not make any special insurance other than that. Yes! 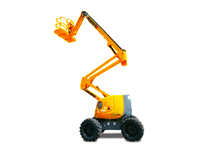 CIF and C&F price do include the freight and insurance charges as well. However, the freight charges depend on the dimensions of the Japanese cars and the destination port. Telegraph Transfer is the only pament method that we accept; which means that we do not accept credit card or letter of credit. 100% payment must be paid ub advance. a. We have a network of branches all around the world. b. 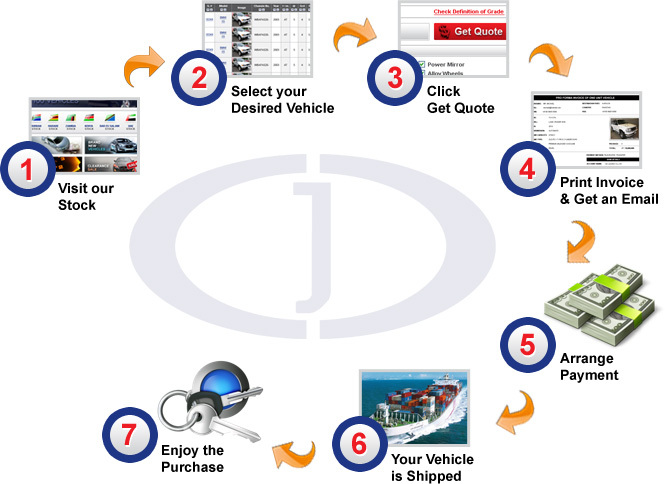 Car junction is a registered company and has been serving quality vehicles to customers for more than a decade. c. Member of huge variety of auto auctions in Japan such as USS, JU, BCN, etc. d. We have more than 80,000 satisfied customers worldwide. Read our customer testimonials for more satisfaction. You can visit bank details page to get information about our GBP, USD and Yen bank accounts. We will inform you about our bank account details and passport ID information during the purchasing process. We accept British pound (GBP), American dollar (USD), Euro and Japanese Yen. Yes! We do give invitation letter to our existing customers who have remitted payment and in reference to the vehicle we can issue a letter for visa purposes. We will send you following documents by courier when the vessel has departed. We will inform your shipping schedule by Booking Notice when your purchase has been successfully confirmed. Import laws vary from country to country so do make sure to check the customs and registration laws of your country before entering into the purchasing process. We provide vehicles on demand as well on the request of our customers. Write to us at [email protected]. Before writing to us, make sure that the specific vehicle is not available in our stock. Our stock are updated regularly, do visit and let us know when you find a used car of your choice. The chances of finding such cars in Japan are very small because there are no left hand drive cars in Japan. However, we try our level best to arrange such cars because of the quantity of demand by foreign customers. Please click left hand vehicles to take a look at our stock. No, we don`t provide any warranty on Japanese used cars, but we openly disclose the condition of the Japanese car including any interior/exterior damage, repair history, distance the Japanese car has been driven, etc. In order to keep the condition of the vehicle transparent and crystal clear with our customers. When you have received all documents by air courier, you will be able to start necessary clearing works with your clearing agent at destination port. Our coordinated clearing agents are available at East and Southern African ports. If these FAQs don`t answer your question please email us to get a quick answer.